"Quick and easy chicken chili for the whole family. Serve plain or over rice. Top with tortilla strips, shredded cheese, sour cream, plain yogurt, and/or green onions. Could also be served over tortilla chips for a great nacho dish. Red pepper flakes, cayenne pepper, or chili seasoning mix can also be used to season." Heat olive oil in a saucepan over medium heat; cook and stir onion in the hot oil until softened, 5 to 10 minutes. Add salsa and water to onion and bring to a boil. 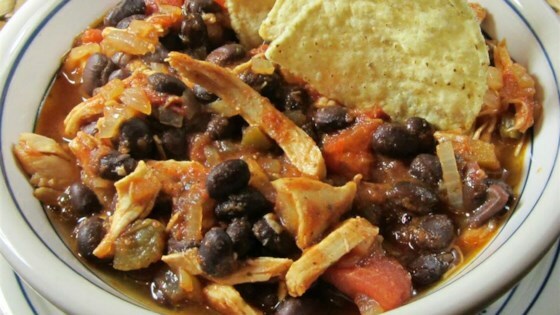 Reduce heat and simmer; add chicken, black beans, and chili powder and return to a simmer. Cover saucepan and simmer chili until chicken is heated through, about 10 minutes. See how to make a simple and delicious white bean chili. For the time and simplicity in making this chili, it is quite respectable. How well you like this chili will be determined by the quality of the salsa you use. Yummy! Added a can of diced tomatoes that were flavoured with garlic and olive oil as well as a can of Bush's chili beans. Doubled the chicken and added over 2 cups of homemade salsa. We loved the chili, but I found it needed about twice as much salsa and 8 oz. Of tomato sauce. Otherwise it was too dry. We like rotisserie chicken and that made it good. It is more of a topping for chips than chili, but is pretty tasty! I didn't have any sour cream but it was still yummy! Extremely easy and very tasty! This was delicious! I did Cook the chicken myself, but followed the recipe otherwise. It was flavorful and so easy to make!